"For the historian of science, few documents are as valuable as the description of a discovery by the scientists involved in the action. Unfortunately few scientists take the time to record for posterity the course of events which led to the discoveries which were the fruit of their labor" (Lechevalier, 1991). "I have often thought how much more interesting science would be if those who created it told how it really happened, rather than reported it logically and impersonally, as they often do in scientific papers" (Beadle, 1992). "Over the years, the story of streptomycin's discovery has been terribly garbled. I think ... it would be a great service if ... Dr. Schatz told his own accurate and interesting account of his finding. Streptomycin turned out to be a milestone in the history of drugs to treat tuberculosis and other infections. Dr. Schatz's role has been largely ignored. The record about this discovery should be set straight" (Doris Jones Ralston, a fellow graduate student when I did the streptomycin research). This year, 1993, is the 50th anniversary of the discovery of streptomycin. It was on October 19, 1943, at about 2:00 in the afternoon, that I realized I had found a new antibiotic. The report of its discovery was published in January of 1944 (Schatz et al., 1944). But I prefer to begin this story of the discovery of streptomycin with a 50-year-old fairy tale about a sick chicken. That fictitious account of the discovery of streptomycin recently appeared as follows in the Smithsonian magazine (Chowder, 1992). "A New Jersey farmer was upset: his chickens were catching a strange infection from barnyard dirt. He took the birds to the Rutgers University laboratory of microbiologist Selman Waksman, who analyzed the barnyard soil and isolated the problem - a peculiar fungus. In the process, Waksman fortuitously discovered that the microorganism had properties besides the ability to make chickens sick. The fungus produced a chemical agent that slowed the growth of certain bacteria". The Rutgers Magazine also recently retold this myth (Smolen, 1992). These accounts egregiously distort and misrepresent the circumstances involved in the discovery of streptomycin. I want to present the true story of the discovery of streptomycin which I am uniquely qualified to do because I literally lived it! I began the research that led to streptomycin when I was in the army during world War II. In May, 1942, I graduated from Rutgers University with a major in Soil Science. The day after I received my Bachelor of Science degree, I became a student again. But this time I was a graduate student who wanted a Ph.D. degree. I worked for six months in Selman Waksman's Department of Soil Microbiology at Rutgers University on the production of fumaric acid and three antibiotics: actinomycin, clavacin and streptothricin. Unfortunately, these antibiotics were too toxic to have practical value in treating human infectious diseases. Nevertheless, this work gave me an introduction to the field of antibiotics. World War II interrupted the lives of many students. In November, 1942, I became a bacteriologist in the Medical Detachment of the Air Force, and was stationed in army hospitals in Florida. This experience provided me with firsthand knowledge of the inability, at that time, to control many infectious diseases. Sulfa drugs were useful in some cases but had serious limitations. The antibiotics tyrothricin, gramicidin and tyrocidin could be applied topically, but were too toxic for systemic use. Penicillin was a new antibiotic that was active against gram-positive bacteria. There was no means of effectively controlling tuberculosis and infections caused by gram-negative bacteria. I therefore began devoting my spare time, when I was off duty, to a search for an antibiotic that would be effective against gram-negative bacteria. For this purpose, I isolated and tested molds and actinomycetes from contaminated blood culture plates and from Florida soils, swamps and coastal sea water. I sent Waksman cultures that I thought merited further testing which I could not do in army hospitals. Waksman acknowledged that I had done that work in Florida. In his pretrial deposition (testimony under oath, in a lawsuit that will be discussed) he stated that I had sent him cultures from Florida (Anonymous, 1950). In a publication which he coauthored with Elizabeth Bugle he reported that one culture, which they tested, "was isolated by Private A.Schatz while stationed at the Miami Beach Military Hospital in April of 1943 from a meningococcus blood agar plate" (Anonymous, 1950). My research in the army was terminated when I was discharged on June 15, 1943, due to a back injury sustained in the army. I could then have gotten a well-paying job in a chemical or pharmaceutical company. Instead, I chose to work for a Ph.D. degree with an income of only $40.00 a month. I told Waksman that I wanted to continue my search for an antibiotic against gram-negative bacteria as my doctoral research project. Waksman agreed. He knew this would be a continuation of the work I had been doing during my off-duty hours in army hospitals. Shortly thereafter, William Feldman at the Mayo Clinic suggested to Waksman that he look for an antibiotic to treat human tuberculosis. However, Waksman was reluctant to do that because, he told me, he was afraid to have Mycobacterium tuberculosis (hominis), which causes human TB, in his laboratory. When I told him I wanted to work with that organism and include the search for an antibiotic against tuberculosis as part of my Ph.D. research, Waksman informed Feldman that he would take on the TB project. I then had two problems to work on: finding an antibiotic active against the tubercle bacillus and an antibiotic active against gram-negative bacteria. Waksman originally thought there was little likelihood of my finding an antibiotic that would be effective in treating tuberculosis because of the external waxy coating which protected the tubercle bacillus. He also knew that tubercle bacilli got into the soil. "It is estimated that the thirty pounds of moist feces produced daily by the average cow would contain, in the case of diseased animals, 37,000,000 microscopically demonstrable tubercle bacilli" (Lipman, 1921). And he knew that tubercle bacilli "survive in the soil for many years without losing their virulence" (Waksman, 1932). There was nothing fortuitous about the discovery of streptomycin in the sense that the Smithsonian article implies (Chowder, 1992). The research I did in 1943, reported in my doctoral dissertation (Schatz, 1945) and my publications (Schatz et al., 1944; Schatz and Waksman, 1944, 1945), was specifically designed to achieve the two above-mentioned objectives. The wording of these objectives in my doctoral dissertation is: "Two problems, therefore, appeared to be of sufficient interest to warrant investigation; namely ... a search for an antibiotic agent possessing ... activity against gram-negative eubacteria and a search for a specific antimycobacterial agent" (Schatz, 1945) active against the tubercle bacillus. There are comments in the literature that Waksman and I did not at first fully appreciate the importance of streptomycin. That may have been true for Waksman, but it certainly was not true for me. I wanted to find an antibiotic that would be effective in treating human tuberculosis. That is why, as reported in my doctoral dissertation (Schatz, 1945), I specifically worked with a virulent human strain of the tubercle bacillus. It is true that I did not point out the potential importance of streptomycin for treating tuberculosis in the paper I wrote about streptomycin inhibiting the tubercle bacillus in vitro (Schatz et al., 1944). But there was insufficient information at that time about toxicity and in vivo efficacy. I therefore did not want to raise people's hopes with claims that might subsequently be refuted. I isolated two strains of Streptomyces griseus from two separate sources. Both strains produced streptomycin. And streptomycin was effective against both gram-negative bacteria and the tubercle bacillus. I called one strain of S.griseus 18-16 because it was the 16th actinomycete I isolated from a heavily manured field soil. That was the 18th soil from which I obtained actinomycetes to test for antibiotic activity (Schatz, 1945). I isolated another strain of S.griseus from a petri dish which my fellow graduate student Doris Jones, now Doris Ralston, had streaked with a swab from a healthy chicken's throat. S.griseus is an actinomycete that is widely distributed in soils. Its spores can be blown around in the air and inhaled by people and animals. At that time, Doris was working in the laboratory of Frederick Beaudette, a veterinarian and poultry pathologist in the Department of Poultry Science at the Rutgers University College of Agriculture and the New Jersey Agricultural Experiment Station. She was studying The Effect of Microorganisms and Antibiotic Substances on Viruses (Jones, 1945). Doris gave me some of her petri dishes with colonies of various microorganisms after she had made transfers from those colonies that she wanted for her research. I called that second isolate D-1 because it was the first (No. I) actinomycete I isolated from the plates that Doris (D) gave me. To eliminate any doubt about the source of the D-1 strain of S.griseus, I am quoting the following information from Doris Jones' master's degree dissertation. "It had been suggested by Dr.Beaudette that the flora of carrier birds might in some way differ from those of infected, immune and normal fowl, and that certain microorganisms might be responsible for the reduction or elimination of the virus. Accordingly, an attempt was made to survey the tracheal flora of well (emphasis by A.S.) birds with a view to comparing this with the flora of carriers and victims of respiratory virus diseases. Over a period of several weeks, tracheal swabs were streaked out on nutrient agar plates... It was noted at the time that the phenomenon of microbial antagonism occurred. Several plates exhibiting zones of antagonism were examined by Mr.Schatz and from one of them was isolated an active strain of S.griseus" (Jones, 1945). Waksman was chairman of Doris Jones' graduate committee. If he had read her dissertation, as he should have done, he would have known that the chicken was healthy, not sick. The story about the sick chicken is therefore a fairy tale that Waksman concocted as evidence that he had in some way participated in the isolation of the D-l strain of S.griseus. The sick chicken is the only link he had with the actual discovery of streptomycin. He never saw the plates which Doris Jones gave me. Milton Wainwright published a detailed account of how this poor, sick chicken was created and passed around (Wainwright, 1991). Farmers who had sick chickens routinely took them to the poultry pathologist, Beaudette, not to the soil microbiologist, Waksman. The saga of the sick chicken which Waksman sired was only the beginning of the false history of the discovery of streptomycin that he fabricated. "Waksman once told a famous numbers story as follows: 'We isolated one hundred thousand strains of streptomycetes' (formerly known as actinomycetes), 'ten thousand were active on agar media, one thousand were active in broth culture, one hundred were active in animals, ten had activity against experimental T.B. and one turned out to produce streptomycin'. 'Dr.Lechevalier, who told this story in 1975, went on to say: of course, this whole arithmetic is phony and what this story shows is an obsession for numbers' " (Luedemann, 1991). None of Waksman's above-mentioned comments apply to the discovery of streptomycin. I isolated all the actinomycetes that I tested. Waksman did not isolate a single one of them. My streptomycin research began in late June of 1943, shortly after I was discharged from the army. On October 19, 1943, I realized I had found a new antibiotic, and decided to call it streptomycin. The publication announcing the discovery of streptomycin appeared in January, 1943. During the four month interval between June and October, 1943, I worked day and night, and often slept in the laboratory. I prepared my own media and washed and sterilized the glassware I used. This work was done 50 years ago with glass petri dishes that were reused, and test tubes with cotton plugs. I was the first and probably the only one who ever worked with the tubercle bacillus in Waksman's laboratory. I could not possibly have isolated and tested 100,000 actinomycetes against the tubercle bacillus in four months! Finally, Waksman's own writing (Wainwright, 1991) confirms what I reported in my doctoral dissertation (Schatz, 1945); namely, that I had isolated two strains of S.griseus, not one, which produced streptomycin. Even before I began my doctoral research, Waksman knew that the strain of S.griseus which he had isolated in 1916 and kept in his culture collection did not produce any antibiotic. Waksman was therefore not directly involved in any way with the early stages of my streptomycin research, which I did independently of him in a basement laboratory. For one thing, he was away at Woods Hole, Massachusetts, and elsewhere for much of that time. Secondly, I did not need him or anyone else to tell me what research to do, how to do it and how to interpret the results. The techniques and equipment I used were simple and familiar to students who had taken undergraduate courses in Soil Microbiology and Chemistry. Also, I had done isolation and testing in an army hospital before I began my streptomycin research in Waksman's laboratory. I translated the relevant French and German literature as well as the works, in Russian, of Krassilnikov, Koreniako, Nakhimovskaia, Kriss and others (Lipman, 1921). Their research on microbial antagonisms and antibiotic action by actinomycetes during the 1930s antedated Waksman's debut in that field. Waksman does not comment on microbial antagonism in his book Principles of Soil Microbiology published in 1932 (Waksman, 1932). Nor does his book refer to the work of Papacostas and Gate who in 1928 used the term antibiotic and reported clinical applications of antibiotic substances (Papacostas and Gate, 1928). In 1943, I lent Waksman my copy of Papacostas and Gates book which he never returned. I could translate the above-mentioned Russian publications because I learned Russian as a young boy on my grandparents' farm in Connecticut. Later, in the summer between my third and fourth undergraduate years at Rutgers University, I learned more Russian in a course I took at Columbia University. I was at that time interested in Pedology - the science of the origin, formation and distribution of soils; and planned to get a Ph.D. in that field. I therefore wanted to be able to translate the original Russian works of Dokuchaev, Glinka and others who established the science of Pedology. In my research in Pedology, I introduced the concept of chelation as a major mechanism in the formation and fertility of soils (Tompkins and Bird, 1989). I therefore did not need a tutor for my streptomycin research. There was simply no need for Waksman to do anything after he arranged for me to receive a monthly stipend of $40.00. I subsequently learned that that was the lowest stipend of all graduate students in his department at the time. I was 23 years old, skinny, and weighed only 120 pounds. But I had an overwhelming compulsion to find something that would control infections caused by gram-negative bacteria and the tubercle bacillus. It is hard to imagine what life was like in the pre-antibiotic era. During my early years in school, some of my classmates, friends and relatives died of infectious diseases. When I worked in army hospitals in World War II, I saw first-hand the tragedy of uncontrollable gram-negative bacteria. They were killing wounded servicemen, some of whom had been flown back to the U.S. from the North African campaign. I isolated and identified the deadly bacteria. That was the easy part. I often spent many hours at night with servicemen as they were dying. That was the hard part. Why did I also take on the seemingly impossible challenge of finding an antibiotic that would be effective in treating tuberculosis? Again, as a young boy in a working class family, I knew people who died of tuberculosis. Tuberculosis has killed more people than any other infectious disease. It is responsible for the death of a thousand million human beings. To keep body and soul together when I was a graduate student, I lived rent-free in a small room in one of the Plant Physiology greenhouses. In return, I prepared mineral solutions for research on the hydroponic growth of plants, watered and fertilized other plants growing in soil, swept the floor of the workroom area, maintained the proper temperature during winter months, and did other chores. Because my income was only $40.00 a month, I ate fruit, vegetables, and dairy products which I obtained free from the respective departments at the Agricultural Experiment Station. Waksman had three laboratories. His office and two laboratories were on the third floor of what we called the "Administration Building. The third laboratory was in the basement of the same building. Waksman assigned me to work in the basement laboratory because he wanted to be as far away from the tubercle bacillus as he could. That is also why he never visited me in the basement laboratory during the entire time I did my streptomycin research. He stayed away from me and what I was doing for several reasons. 1. Waksman told me he was deathly afraid of tuberculosis, and with good reason. Tuberculosis, also known as The Great White Plague, is responsible for the deaths of an estimated one billion people. 2. There was at that time no effective treatment for tuberculosis. 3. I insisted on working with the H-37 strain of the tubercle bacillus which I obtained from William Feldman at the Mayo Clinic, because it was the most highly virulent strain then available. Feldman advised me to be very careful with it because what I was doing was very dangerous. Waksman insisted that I never bring any TB culture up to the third floor where he was located. Feldman himself subsequently developed tuberculosis which his doctor believed was caused by the same strain of the tubercle bacillus he had sent me and with which he and I had been working. This is why Frank Ryan wrote that "The fears of Albert Schatz' colleagues, who had refused to work with such a dangerous bacterium, were now amply justified" (Ryan, 1992). Fortunately, Feldman's life was saved by "combination chemotherapy with PAS (para-aminosalkylic acid) and streptomycin ... How fitting that it arrived just in time to help save the life of the wonderfully unassuming William Feldman" (Ryan, 1992). 4. The basement laboratory in which I worked was set up for soil microbiology. It therefore had none of the safety features of a modern TB laboratory, such as a special inoculation chamber with ultraviolet light, and positive air pressure to circulate the laboratory air through a filter. I did not even have a special incubator for my TB cultures. In retrospect, I feel good because no one who used that laboratory and no one who worked elsewhere in that building developed tuberculosis. But I developed a positive tuberculin reaction. Waksman became interested in and involved himself in my research only after I had isolated the two strains of S.griseus, demonstrated that they both produced the same antibiotic, established that streptomycin (which I named) was a new antibiotic, identified S.griseus, and found that streptomycin inhibited the growth of the tubercle bacillus in vitro. Waksman then had others in his two third-floor laboratories verify the results I had obtained up to that time, except for the work I did with the tubercle bacillus. He was afraid to have others work with that organism in his third-floor laboratories, one of which was next to his office. I also produced in that basement laboratory the streptomycin which Doris Jones et al. used in the first in vivo tests at Rutgers (Jones et al., 1944), and which Feldman used for the first toxicity tests and the first animal experiment with the tubercle bacillus at the Mayo Clinic. For large-scale production, I used endless numbers of one liter Erlenmeyer flasks containing 250 milliliters of broth. I also ran two or three stills 24 hours a day until I had enough streptomycin to satisfy Feldman's needs. During that time, I slept on a wooden bench in the laboratory. I drew a horizontal line with a red glassmarking pencil on the flasks from which I was distilling. If I was asleep when the liquid boiled down to the red mark, the night watchman woke me up and I added more liquid. This was during World War II when rationing was in effect. I therefore recycled organic solvents that I used in sufficiently large volumes to justify recycling. I worked day and night to produce that streptomycin because I wanted Feldman to do toxicity and in vivo tests as soon as possible, and because Waksman did not assign anyone to help me. But the night watchman helped. I believe that S.griseus is the first actinomycete used for large-scale industrial production. The stills in the basement laboratory recalled a small still I ran, during Prohibition, to convert grain to alcohol when I was a young boy on a farm in Connecticut. In 1963, William Feldman and his wife, Ruth, visited my wife Vivian and me in Santiago, Chile, when they were on a group tour of South America. I was at that time a professor at the University of Chile. When we talked about the early days of streptomycin, Feldman was surprised to learn that I had prepared the first streptomycin he used at the Mayo Clinic. He said Waksman never told him that. I earned my Ph.D. degree in two-and-a-half years without having a master's degree. Those two-and-a-half years do not include the five months I worked on the production of fumaric acid, actinomycin, clavacin and streptothricin, which had nothing to do with my dissertation research on streptomycin. I drove myself because I knew how serious tuberculosis and gram-negative infections were, and how important it would be to find antibiotics to control those diseases. What I was working for was, therefore, much more meaningful to me than simply meeting the minimum requirements for a Ph.D. degree. However, I did have time to meet and go walking with a young woman, Vivian Rosenfeld, who was an undergraduate student in the Rutgers University College of Agriculture. Because of my production schedule in preparing streptomycin for the Mayo Clinic and because neither of us had much money we each earned $10.00 a week - we frequently dated in the basement laboratory. When Vivian knocked on one of the laboratory windows, I went to the front door to let her in. Vivian may have subsequently saved my life. In 1947, when Waksman recommended me as the soil microbiologist for the nuclear bomb test in the Bikini Atoll, Vivian insisted that I not go. (This was one of the only two jobs Waksman ever recommended me for). The navy wanted a soil microbiologist to study the microflora before and immediately after the nuclear blast. Many servicemen and others who participated in this and other nuclear bomb tests died of radiation-induced illnesses. 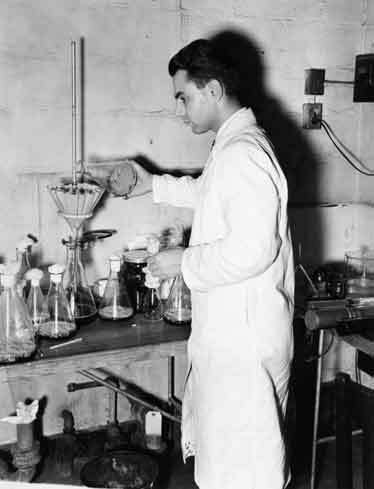 Albert Schatz producing streptomycin in 1943 in the basement laboratory at Rutgers University. This batch of streptomycin was used by William Feldman in the first guinea pig test with Mycobacterium tuberculosis at the Mayo Clinic. This is the true factual account of how I discovered streptomycin. I have already enumerated what I did, independently of Waksman, before he became interested in and actively involved in my work. In addition, I subsequently wrote and am the senior author of the publications which report the discovery of streptomycin (Schatz et al., 1944), its bacteriostatic and bactericidal activity on the tubercle bacillus (Schatz and Waksman, 1944), and strain variation of S.griseus (Schatz and Waksman, 1945). It is unprecedented for a graduate student to be the senior author of three publications which report a discovery of major importance. But Waksman knew that everybody in his department was well aware of what I had done, and how hard I had worked to do it. That's why he permitted me to be the senior author on those three papers. Waksman, who was chairman of my graduate committee, and the other two members (Robert Starkey, Professor of Soil Microbiology, and Walter Russell, Professor of Biochemistry and Dean of the Graduate School at Rutgers University) all accepted my doctoral dissertation as fulfilling the university requirement of original and creative research for the Ph.D. degree. Finally, my name is on several streptomycin patents in the United States and other countries. "In the United States it is required that a patent application be filed in the name of the inventor or inventors ... A patent in the United States is an important document helping to establish the creativity of an individual just as a technical publication is ... Technically in the United States a patent which does not bear the name of an inventor or which bears the name of a person other than the inventor(s) is an invalid patent" (Luedemann, 1991). On May 3, 1946, Waksman and I, at his insistence, both signed the streptomycin patent assignment which stated that each of us would receive $1.00. He did not tell me that he had a previous agreement with the Rutgers Research and Endowment Foundation. According to that agreement, which was contingent on my signing the patent assignment, he would receive 20% of the streptomycin royalties. When I learned, in 1949, that Waksman was secretly receiving royalties, contrary to his personal assurance to me that neither of us would do so, I started a lawsuit. Pretrial depositions taken for that lawsuit revealed that Waksman had, by that time, secretly received $350,000 in royalties, although he had publicly denied receiving any royalties. The Rutgers Research and Endowment Foundation had received $2,600,000 in royalties. I had received no royalties. The lawsuit also revealed that Waksman, during the entire time I was doing research, had a secret agreement with a pharmaceutical company which paid him $300 a month for consulting, and for giving that company exclusive information about the research going on in his laboratories, along with patent rights. When that lawsuit was settled on December 29, 1950, I received a small percentage of the royalties. In that settlement, defendant Waksman acknowledged that "As alleged in the complaint and agreed in the answer, the plaintiff' Albert Schatz "is entitled to credit legally and scientifically as co-discoverer, with Dr.Selman A.Waksman, of streptomycin" (Anonymous, 1950). If Waksman had denied I was a co-discoverer of streptomycin, he would have invalidated all streptomycin patents and stopped payment of all royalties. Robert C. Clothier, President of Rutgers University and President of the Rutgers Research and Endowment Foundation, issued a press release on December 29, 1950, the day the lawsuit was settled. In it, he said, "It has never been disputed that Dr.Schatz was a codiscoverer of streptomycin. That has been a matter of public record since 1945, when Dr. Waksman and Dr.Schatz jointly applied for the streptomycin patent". But Clothier neglected to mention me in his 1949-1950 annual report to the Governor of New Jersey. That report is required by the New Jersey State Legislature and the U.S. Congress, which appropriates funds to Rutgers University. In that report, dated September 1, 1950, Clothier informed the governor about "the discovery of the antibiotic, streptomycin, by Dr. Waksman". Waksman disregarded what he had agreed to in the lawsuit, when he accepted the Nobel Prize awarded specifically for the discovery of streptomycin. He also disregarded the oath which he and I had jointly signed as part of the patent application. In that oath, Waksman swore that he "verily" believed that he and I were "the original, first and joint inventors" of streptomycin (Anonymous, 1948). Waksman also disregarded his February 9, 1945, affidavit, which he submitted to the patent office, in which he referred to "streptomycin, the new antibiotic that Schatz and I have discovered" (Anonymous, 1948). He also disregarded the February 9, 1945 affidavit of Elizabeth Bugie, a fellow graduate student who confirmed some of my original findings. In her affidavit, also submitted to the patent office, Bugie wrote, "As an assistant to Dr. Waksman, I first learned from him about streptomycin, which he and Dr.Schatz had discovered" (Anonymous, 1948). However, by 1949, when I asked Waksman what was being done with the royalties, he had already received fame and a substantial amount of those royalties. "By that time he had convinced himself that Schatz's contribution to the discovery of streptomycin was 'only a small one'" (Wainwright, 1988). Although this is the 50th anniversary of the discovery of streptomycin, it is only within the past few years that the true story of that discovery has become widely known. One way to evaluate the importance of my contribution is to separate the actual discovery of streptomycin from the developmental work that was subsequently done to produce it for wide-spread use. In this respect, Luedemann wrote: "The important thing is to get the culture to start with ... If you don't have anything to work with ... you're not going to get very far ... Without the organism, you don't have the antibiotic (Carlos C. Carpenter) ... Discoveries are made by individuals, and it rarely can be any other way ... After all, how many collaborators can dance on the point of a discovery?" (Luedemann, 1991). My contribution can also be evaluated in another way. "As of the end of 1978, we estimate the amounts of royalties received by Rutgers at 12 million dollars for streptomycin ... In 1954, the Institute of Microbiology of Rutgers University opened its doors. This institute had been made possible by a grant of 3.5 million dollars by the Rutgers Research and Endowment Foundation to Rutgers University" (Lechevalier, 1980). By 1954, all or almost all of the royalties came from streptomycin patents. I reàeived considerably less. royalties than Waksman did. (Originally I received none). It therefore follows that I contributed more of the $3,500,000 streptomycin royalties for the Institute than Waksman did. This is the story of what I did and how and why I did it. What Waksman did was have others confirm my original results (except my in vitro work with the tubercle bacillus), and continue the research I initiated on the production and purification of streptomycin. He also began to trivialize me and what I had done. Waksman explained why he did that in a conversation with Doris Jones. In a pretrial deposition, Doris recalled Waksman's comment. "Dr. Waksman told me confidentially that the reason why he didn't let Al have more credit for the discovery of streptomycin was that he was so aggressive, and if he were allowed this credit, it would go to his head and, therefore, Dr.Waksman was protecting Al, since he was older and could assume credit for this discovery. That was why he hadn't pushed Al's name" (Anonymous, 1950). When I discovered streptomycin in 1943, I was a 23-year-old, idealistic graduate student. Waksman, my department head, was a business-oriented consultant to a pharmaceutical company. But I did not know that until my lawsuit in 1950. When Waksman realized that streptomycin was a major discovery with considerable financial potentiality, he set himself up (on the third floor of the Administration Building) as the fountainhead of information about streptomycin. He kept me in the basement laboratory and, after a while, no longer introduced me to or even told me about reporters and others who interviewed him. I learned about what was going on when I read magazine articles, newspaper accounts and other reports. These were written by people who got all their information from Waksman. They did not know, because Waksman never told them, that I was in the basement laboratory of the same building where and when they were interviewing him. Waksman also participated in the large-scale development of streptomycin for use world-wide; negotiated patent arrangements with pharmaceutical companies, from which he profited handsomely; and eventually took full credit for the discovery of streptomycin. Others, however, have recognized and acknowledged my role in the discovery of streptomycin. After penicillin was discovered in 1929, it laid dormant for several years. But streptomycin, which was discovered in 1943, was destined to receive immediate attention. That would have occurred even without Waksman's involvement in its industrial development. World War II, which needed penicillin, also needed streptomycin. Waksman created the myth that he, and he alone, had discovered streptomycin, just as he created the myth of his sick chicken. Until I read the articles in the Smithsonian and in the Rutgers Magazine, I assumed that Wainwright had laid the myth of that poor, sick chicken to rest (Wainwright, 1991), as he had done with the myth that Waksman wove around himself (Wainwright, 1988, 1989, 1990, 1991). Wainwright concluded that "Streptomycin was in fact discovered by one of Waksman's research students, Albert Schatz" (Wainwright, 1989). And, "There can be no doubt that streptomycin was actually discovered by Albert Schatz" (Wainwright, 1988). "Anyone who reads Schatz's thesis ... cannot doubt that it was he who made streptomycin a reality" (Wainwright, 1988). In his book, Miracle Cure: The Story of Antibiotics, Wainwright wrote, "The history of streptomycin ... in Chapter 8 ... is the first detailed account of this story to be published, and in it I have once again attempted to redress an historical imbalance, this time in favor of Albert Schatz, one of its co-discoverers. In so doing, I hope I have not been unfair to the memory of Selman Waksman, the co-discoverer who received all the credit for streptomycin" (Wainwright, 1990). Frank Ryan also discussed my role in the discovery of streptomycin in his recent book Tuberculosis: The Greatest Story Never Told. Among other things, he wrote, "So, calmly and methodically, Albert Schatz, barely twenty-three years old, now performed an experiment that would ultimately prove one of the most important in the history of medicine. He tested streptomycin against tuberculosis" (Ryan, 1992). Both Milton Wainwright and Frank Ryan visited me in Philadelphia, independently of one another, to interview me at length, for four days, for the books they were writing. Peter Tompkins and Christopher Bird pointed out that "Albert Schatz, Ph.D., discovered the wonder drug streptomycin", in their book Secrets of the Soil (Tompkins and Bird, 1989). In 1991, George Luedemann commented on "the discovery of streptomycin by Albert Schatz" and then went on to say: "This antibiotic was useful against tuberculosis and was significantly less toxic than the antibiotics that had previously been found ... Thus the golden age of antibiotics was born - an age of miracles and magic bullets - substances produced without seeming reason by esoteric microbes which had previously been studied mostly because of the diseases they caused in plants, animals and men. It seemed as if yesterday's villainous microbes had suddenly become today's heroes". On April 15, 1993, the Theobald Smith Society, which is the New Jersey Branch of the American Society for Microbiology, acknowledged my role in the discovery of streptomycin. I received the Selman A.Waksman Honorary Lectureship Award Medal. The title of my lecture was Looking Back on Fifty Years of Research. This lecture was historically connected with a paper I presented at a meeting of the Theobald Smith Society fifty years ago. As a graduate student, I had been invited to speak on streptomycin as a new antibiotic and its potential in treating tuberculosis. That was the first report about streptomycin presented to a scientific society. It was also the first time I spoke at a scientific meeting. So great was the curtain of silence that Waksman wove around my role in the discovery of streptomycin that only recently have I been again invited to tell my story in the United States. This is the second article I have written in the 50 years that have elapsed since the discovery of streptomycin in 1943. I am grateful to the editor of Actinomycetes for publishing this account of my role in that discovery. I have been asked on several occasions why my first article, Some Personal Reflections on the Discovery of Streptomycin, was published in the Pakistan Dental Review, in 1965 (Scatz, 1965). That article was an address'I delivered on November 5, 1964, at a ceremony in the Thorax Hospital, Santiago, Chile, when I was honored for the discovery of streptomycin. I had previously, over a period of several years, submitted that article to editors of many U.S. journals, who either rejected it or never acknowledged receiving it. By 1965, I had done considerable research on dental caries, and was an associate editor of the Pakistan Dental Review. That is why my first article was published in that journal. Anonymous (1948). U.S. Patent Office File Wrapper and Contents. Improvement in Streptomycin and Processes of Preparation. No. 2,449,866. Granted Sept. 21, 1948, to S.A. Waksman and A.Schatz. Tompkins, P. & C.Bird (1989). Secrets of the Soil. Harper & Row, New York. 1989.